Texas ranks 2nd in U.S. peanut production. Peanuts generate $560 million for farmers. The state impact exceeds $1.8 billion. Over 70% of the state’s production is in the west Texas region. Insects are scouted on 80% of peanut acreage but less than 25% of the crop is actually sprayed. Key insects are thrips, lesser cornstalk borer (LCB), burrowing bugs, and worm/foliar feeders. Organophosphates are important in Texas and are applied on 10% of the acres. These include phorate/Thimet, chlorpyrifos/Lorsban, disulfoton/Di-syston, and acephate/Orthene. Aldicarb (Temik-carbamate chemistry) is used on 10% of Texas peanuts to combat thrips and nematode problems. Nematodes cause an estimated 4-5% yield loss in Texas peanuts. There are no commercial replacements for aldicarb, except organophosphates or other carbamates. Over 80% of peanut acreage is scouted for diseases and 72% of the crop is treated. Major diseases include early and late leafspot, seed and seedling disease, southern blight (stem rot), pod rot, tomato spotted wilt virus (TSWV), peanut rust, sclerotinia blight, botrytis blight, and web blotch. Two FQPA-targeted fungicides are tebuconazole (Folicur), which is used on 37% of the crop, and chlorothalonil (Bravo a B1 carcinogen) used on 32% of peanut crop. Commercial alternatives include azoxystrobin (Abound) and propiconazole (Tilt). 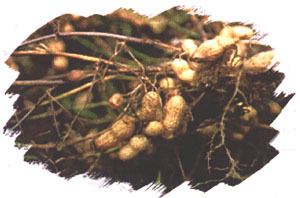 Weeds are the most common pest encountered by peanut growers. Weeds reduce grower profits by competing for sunlight, water and nutrients. Weeds also host pathogens, viruses, and insects plus disrupt harvesting operations. 86% of Texas peanut acreage is scouted for weeds. Over three-fourths of the crop is cultivated, an average of 1.8 times, and over 70% is hand hoed. One-third of the acreage is rotated to other crops for two or more years to reduce weed problems. Essentially all growers (97%-100%) use herbicides and treat at least 93% of Texas peanut acreage. 95% of the herbicides are applied with ground sprayers. The most troublesome weeds in peanuts are pigweed, yellow nutsedge, morningglory, johnsongrass, nightshade, Texas panicum, sunflower, Russian thistle, and eclipta. Key herbicides include pendimethalin (Prowl), trifluralin (Treflan), ethalfluralin (Sonalan), metolachlor (Dual), 2,4-DB (Butyrac), imazapic (Cadre), and imazethapyr (Pursuit). While these herbicides are not in the Phase I of FQPA-targeted products, they will be eventually reviewed. A major concern is the lack of effective soil-applied insecticides and nematicides. Diseases continue to be a problem, especially viruses transmitted by insects. Crop Briefs is an information series developed by Texas A&M AgriLife of the Texas A&M University System on critical pest problems and pesticide needs for Texas agriculture. This effort is supported by the Texas Peanut Producers Board, Western Peanut Growers Association, and other commodity groups. Dr. Dudley Smith, Texas Agricultural Experiment Station and Dr. Juan Anciso, Texas AgriLife Extension Service prepared these reports August 2000 using information from numerous sources. Departmental Report SCS-2000-01.The information given herein is for educational programs only. Reference to commercial products or trade names is made with the understanding no discrimination is intended and no endorsement by the Texas AgriLife Extension Service and the Texas Agricultural Experiment Station is implied.